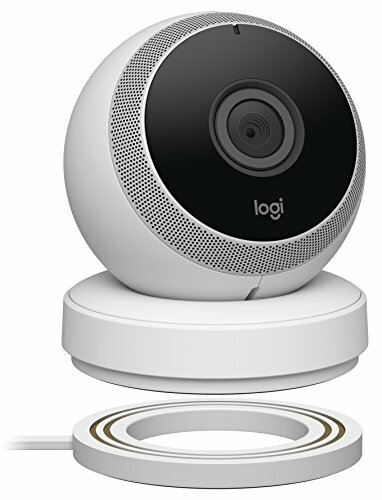 Logitech redesigns its Circle 2 security camera for the smart home set. Logitech has upgraded its well-regard Circle Wi-Fi security camera, but the upgrade is more than a minor cosmetic change—it's a complete re-thinking of what a Wi-Fi security came is and what it should do. Instead of a sphere, the shape of the current Circle, Circle 2 is more disc-like and it's weatherproof (IP65) so it can be mounted indoors or out with the appropriate mount. It's also modular, designed to fit into either an AC- or rechargeable battery-powered enclosure, sold in two different packages ($179.99 for the wired version, $199.99 for the battery), each with a bundled wall mount kit that doubles as a desktop base, starting the first week of July. Logitech's entire Circle 2 product line goes on sale in July. It's not known if the original Circle will continue to be sold or at the same, current $199.99 price. There also will be a small but growing line of Circle 2 accessories available, including a spare battery, a suction-cup window pane mount for pointing the Circle 2 outward, a weatherproof extension cable for connecting to an outdoor AC jack, and an AC mount for plugging the camera directly into an indoor power outlet. Operationally, Logitech has taken a tip from Blink, and a giant leap beyond the original Circle's battery capability. Circle 1's battery lasted a mere two hours, 12 hours in power-saving mode; the Circle 2's battery is designed to last up to three months. Instead of being "always on," power is used only when movement or a face is detected, elongating battery life. App controls also help to lower power consumption. You'll be able to control Circle 2 via the Logitech app. Spec-wise, the big improvement is Circle 2's new nearly warp-free 180-degree lens, which gives users the widest possible view of a room regardless of placement; by comparison, Circle 1 provided "only" a 135-degree view. Like the original, Circle 2 provides 15 feet of night vision coverage, but includes an improved mic/speaker for clearer two-way communication. Circle 2 also will be both Amazon Echo/Alexa and Apple HomeKit compatible; both implementations include manual recording capability not yet available directly from the Logitech Circle app. Circle 2 also can be controlled with Logitech's own POP Smart Buttons. Logitech's Circle 2 has an AC mount so you can plug directly into an indoor outlet. Additional app upgrades will include a new premium option that allows the Circle 2's motion and "eye" sensors to differentiate between people and pets, limiting the number of motion-detected false alarm notifications. However, Logitech has not included actual face detection/ID, believing the technology has yet to be effectively harnessed in security cameras. Like the Circle 1, Circle 2 records 1080p video. You'll get 24 hours free encrypted cloud storage of AES 256-bit encrypted footage, including a searchable time lapse mode, as well as Logitech's existing premium cloud storage plans.